The Ionian Islands are a string of more than hundred small and medium-sized islands located in the Ionian Sea off the Greek west coast. The extension of the archipelago is about 300 km in N to S and appr. 140 km in E to W direction. From N to S the main islands – historically called Heptanese (“the Seven Islands”) – are Corfu (greek: Κέρκυρα), Paxos (Παξοί), Lefkada (Λευκάδα), Ithaca (Ιθάκη), Cephalonia (Κεφαλονιά), Zakynthos (Ζάκυνθος). 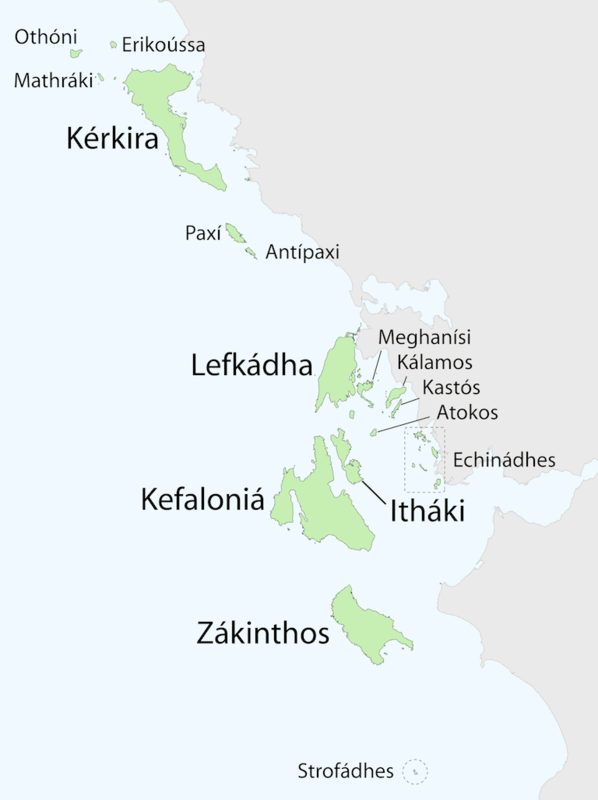 Nowadays the southeasternmost island of Kythira (Κύθηρα), located S of the Peloponnese Peninsula, is politically excluded, belongs to a different biogeographic region, and is therefore not treated in the present survey. 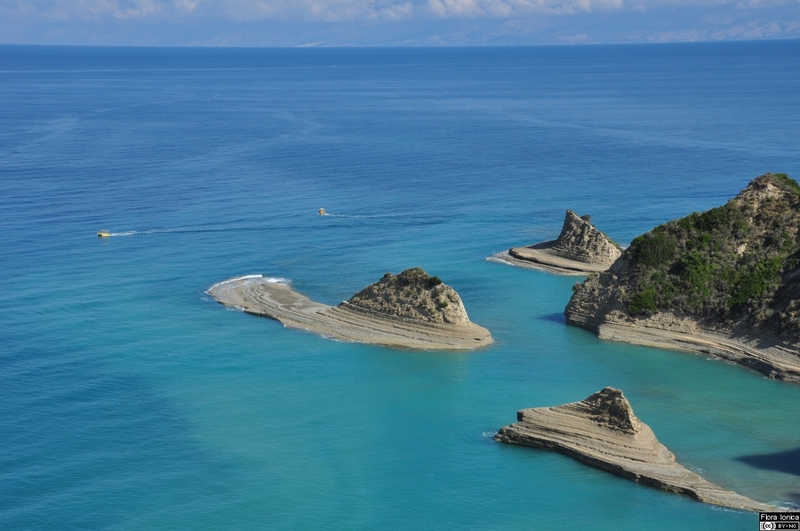 The Diapontian Islands (Διαπόντια νησιά), located NW of Corfu, comprise the inhabited islands of Othonoi (Οθωνοί), Ereikoussa (Ερεικούσσα) and Mathraki (Μαθράκι) as well as several smaller islets. Paxos (Παξοί) together with the southeastern Antipaxos (Αντίπαξοι) and a couple of tiny islets form the Paxos Island group between Corfu and Lefkada. The Taphians (alt. 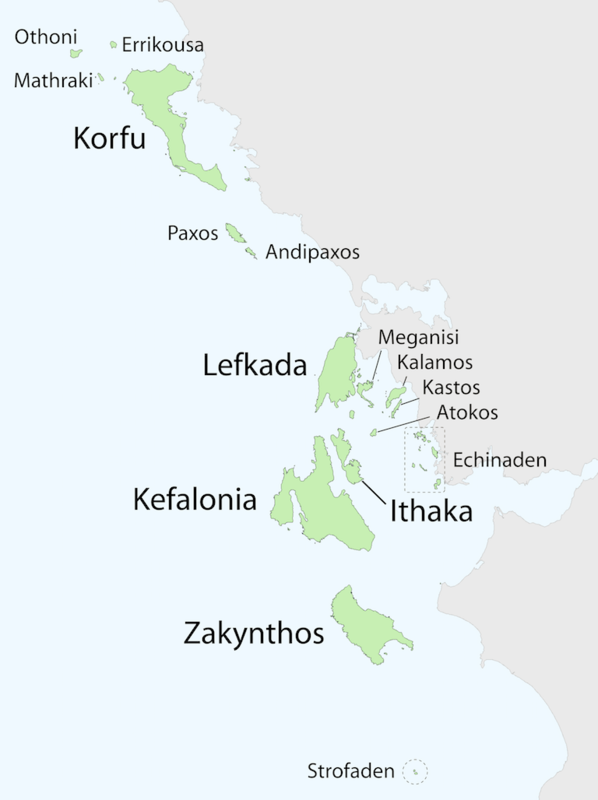 Tilevoides; Τηλεβοΐδες νήσοι), situated between Lefkada and the greek mainland, consist of more than a dozen islands: Kalamos (Κάλαμος), Meganisi (Μεγανήσι), Kastos (Καστός) and Skorpios (Σκορπιός) followed by several uninhabited islets [Kythros (Κύθρος), Sparti (Σπάρτη), Thilia (Θηλιά), Madouri (Μαδουρή), Skorpidi (Σκορπίδι), Provati (Προβάτι), Formikoula (Φορμίκουλα), Mangelaria (Μαγγελαριά), Cheloni (Χελώνη), Alafonisi (Αλαφονήσι), Petalou (Πεταλού) and Tsokari (Τσοκάρη)]. 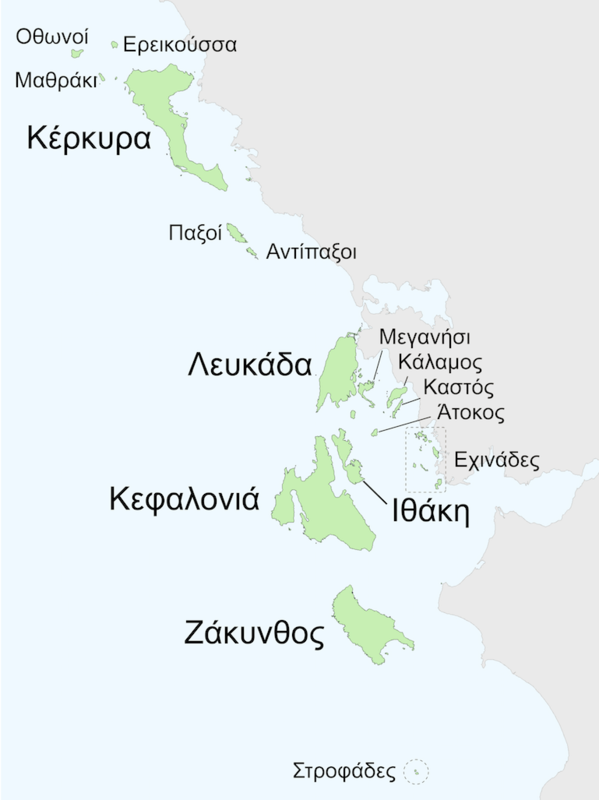 The small islands Arkoudi (Αρκούδι) and Atokos (Άτοκος) are located between Lefkada and Ithaca. 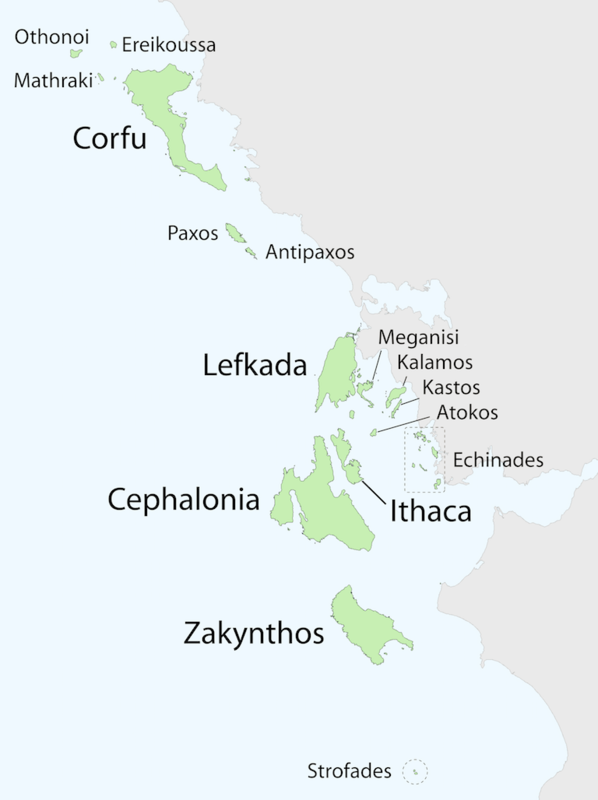 The uninhabited Echinades (Εχινάδες) are an archipelago off the Arcanian coast ranging from Astakos in the North to the Achelous estuary in the South. Thus, having a large N to S extension, they are further divided into three subgroups: the northern Drakoneres [composed of the larger Drakonera (Δρακονέρα), Provati (Προβάτι), Pontikus (Ποντικός) and Karlonisi (Καρλονήσι) as well as a few smaller islands], the Modi island group in the central area [formed by Modi (Μόδι), Apasa (Άπασα), Soros (Σωρός) and Gravaris (κράβαρης)] and the southern Ouniades [composed of Petalas (Πεταλάς), Oxia (Οξεία), Vromonas (Βρόμονας), Makri (Μάκρη) and Kouneli (Κουνέλι)]. 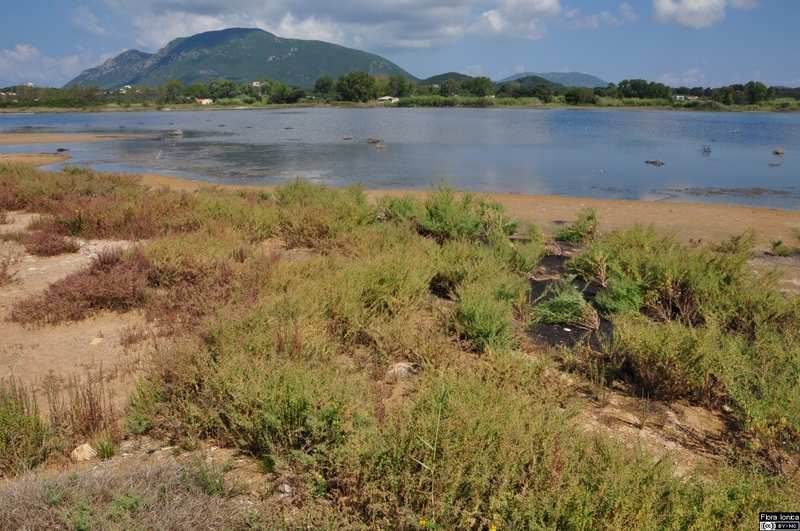 The Strofades (Στροφάδες) comprise two small islets S of Zakynthos: Stamfani (Σταμφάνη) and the smaller Arpia (Άρπυια). 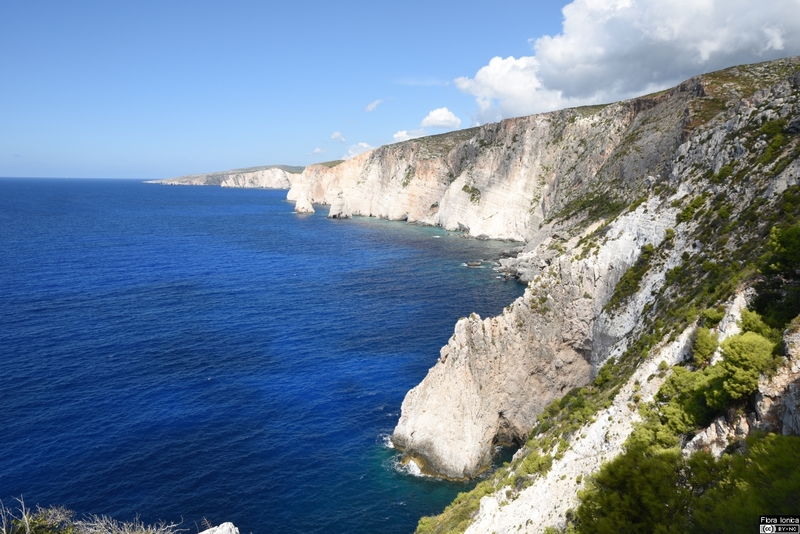 Following Aubouin´s concept of different isopic zones (Mesozoic and Older Tertiary sedimentary facies belts) in Greece, the Ionian Islands are located in the two westernmost zones, the Pre-Apulian Zone in the west and the Ionian Zone in the east (Aubouin 1965). 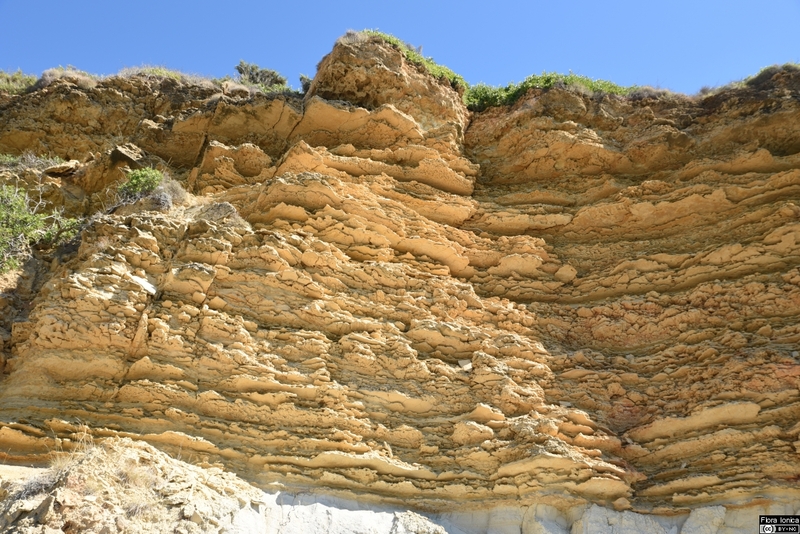 In the Ionian Zone, the sequence of sediments starts with Triassic-Jurassic limestones (locally also schists) and continues mostly with limestones up to the Eocene; then, mainly through Oligocene and up to Lower Miocene, Flysch marls are characteristic (but present on Corfu only). In the Pre-Apulian Zone, the sequence starts with Cretaceous only and is dominated by various types of limestones throughout, up to the Miocene. Finally, and transgrading over parts of both zones, various molasse sediments (marls, sandstones, limestones and breccias) have been deposited from Upper Miocene through Pliocene and even Pleistocene. 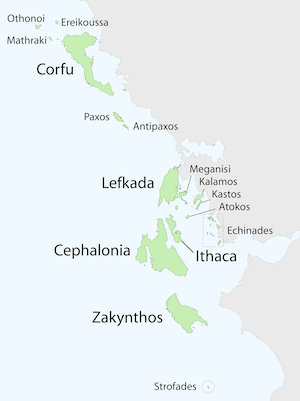 Corfu is located in the Ionian Zone and is widely covered by Miocene - Pliocene marine marls partly overlaid by coquina (hard shelly limestone). 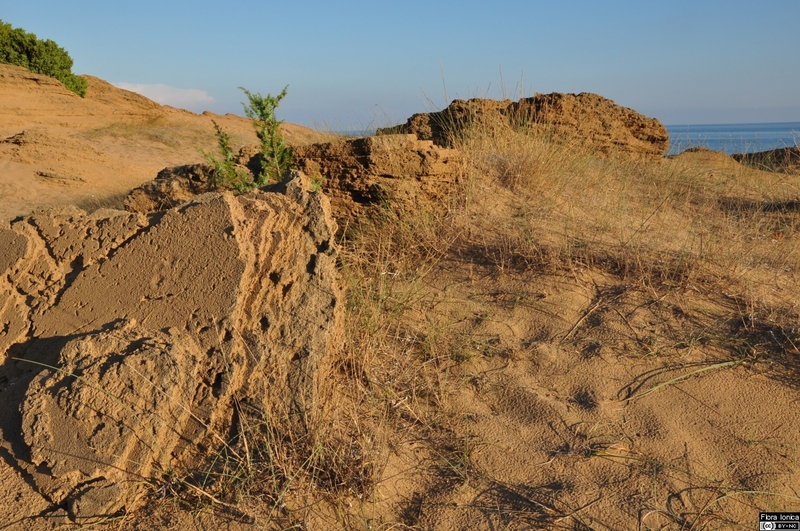 In the region of the Pantokrator massif Triassic–Jurassic limestones and schists are found, similar stripelike patches appear along the western coast. 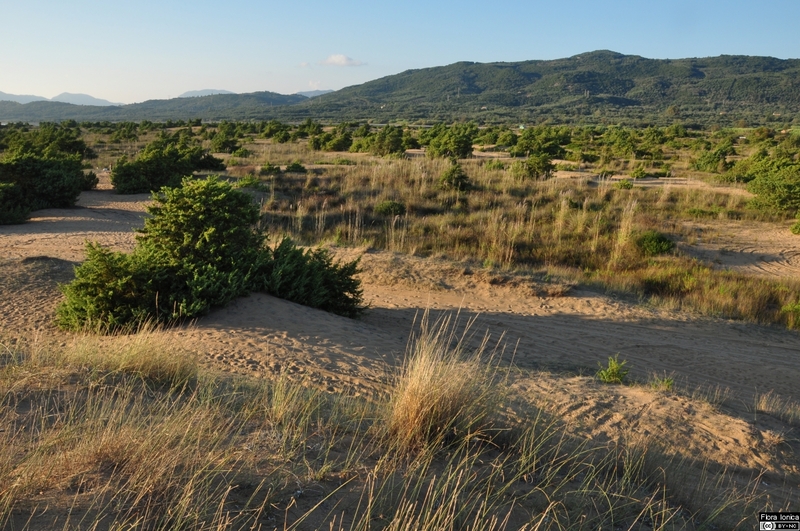 The central part of the island south of the Pantokrator massif partly is dominated by (heterogenous) Triassic breccia (Higgins & Higgins 1996, Maragoudakis & al. 1970, Savoyat & al. 1970). 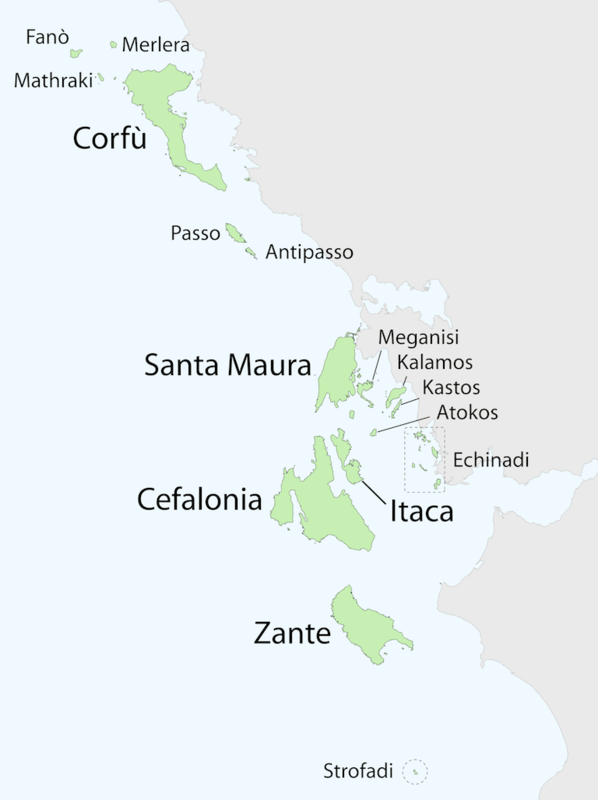 Paxos and Antipaxos are both situated in the Pre-Apulian Zone. 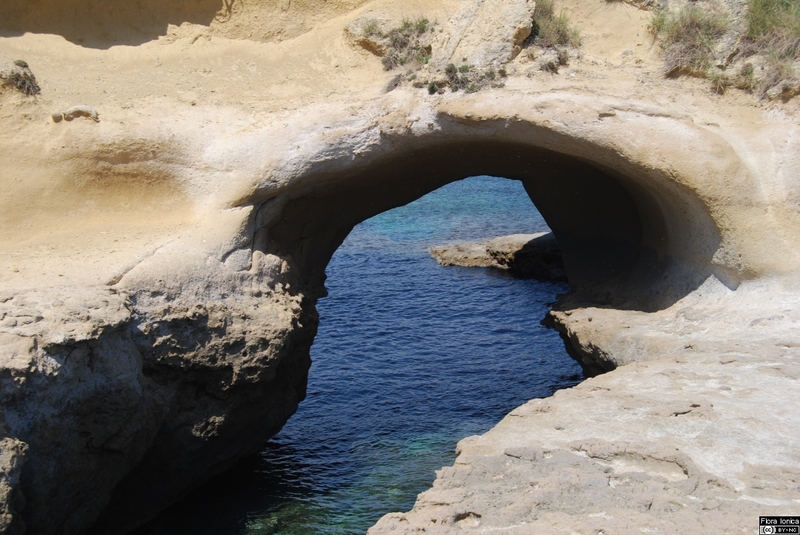 Whereas Antipaxos is completely covered by Pelagic limestone, Paxos shows smaller areas of Micritic limestone in the southeast but is largely covered by Pelagic limestone as well (Higgins & Higgins 1996, Perry & al. 1969). 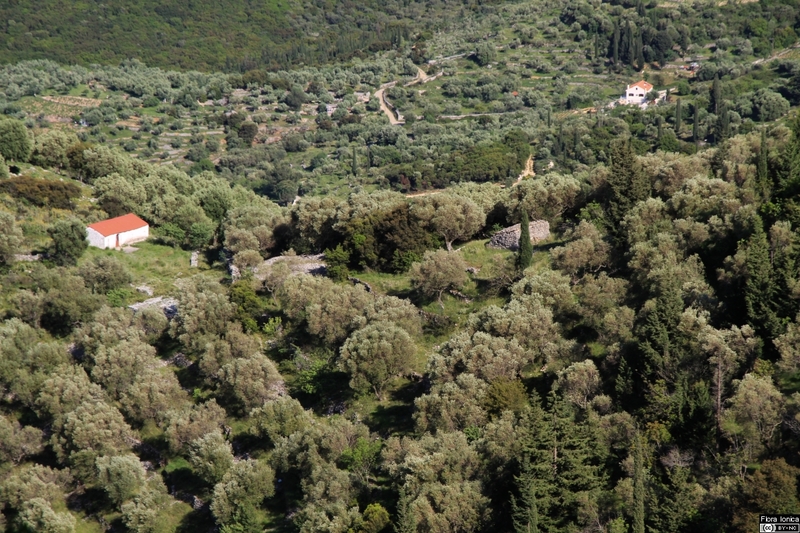 On Lefkada, the Pre-Apulian formations are restricted to the SW part of the island, with limestones in the west as well as clay and sandstone in the east towards the border with the Ionian Zone. 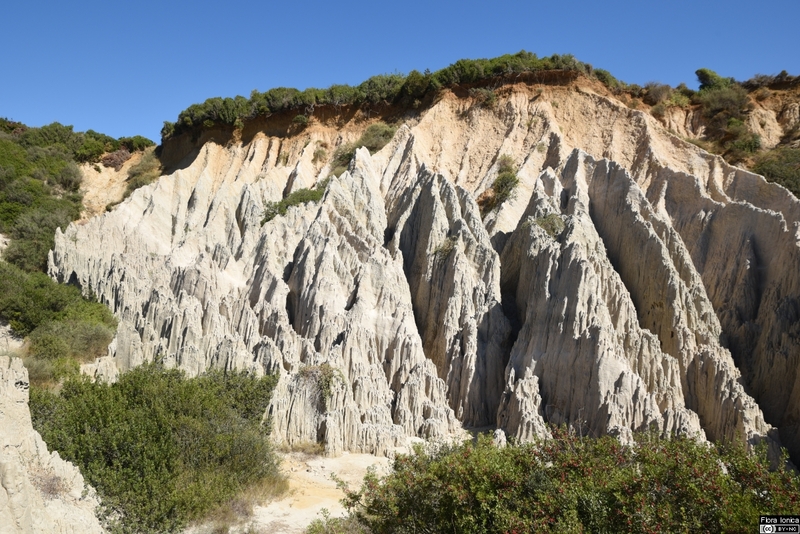 The remaining larger part in the east of the island is represented by the Ionian Zone and dominated by limestone, but also shows small areas of clay and sandstone (mainly in the NE) and flysch (Bathrellos & al. 2009, Higgins & Higgins 1996, Hinsbergen & al. 2006). 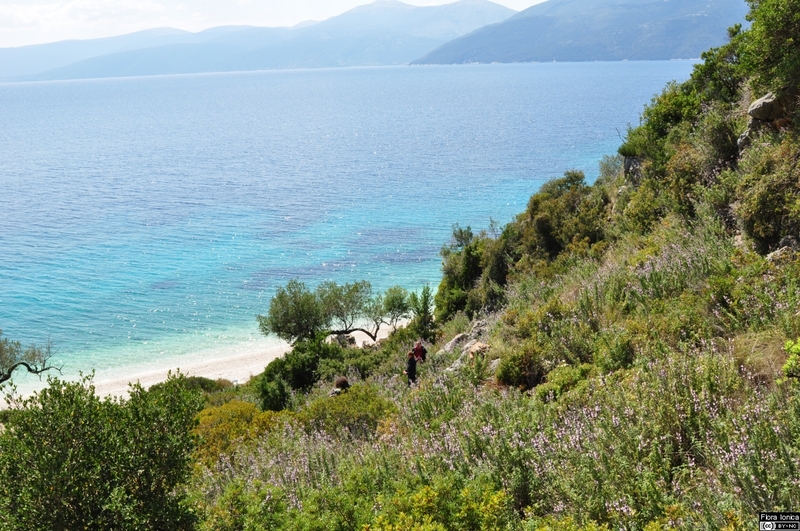 Cephalonia largely belongs to the Pre-Apulian Zone and is dominated by Jurassic to Eocene limestones but the western peninsula is covered by sandstones, brecciated limestones and limestones. 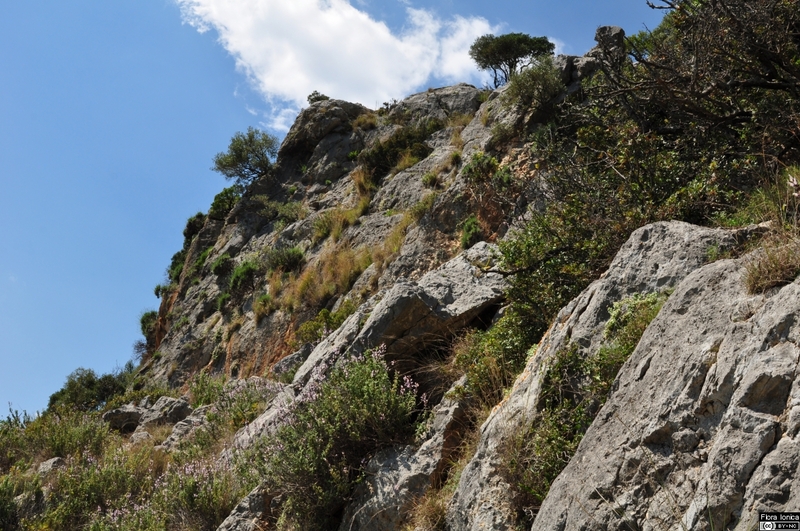 In the southeastern part, belonging to the Ionian Zone, limestones, breccias and schists are found. 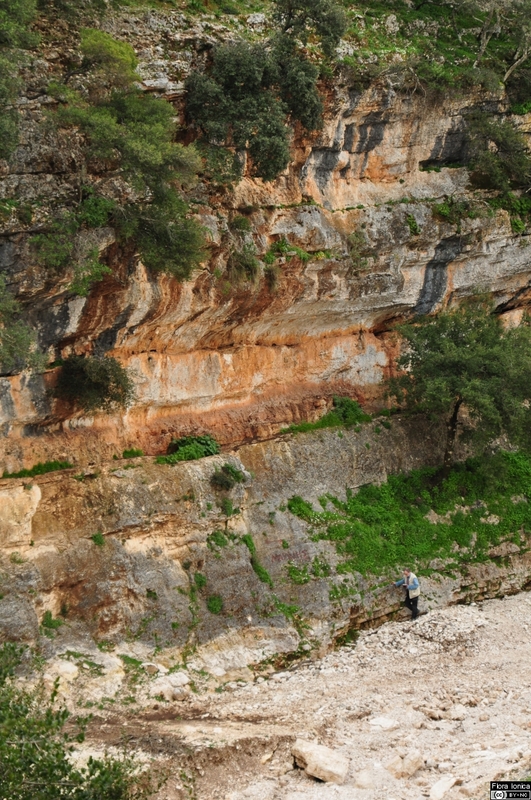 In addition small and stripelike formations of Ammonitico Rosso occur. The central part of the island is dominated by the Aenos mountain range, shaped by Cretaceous dolomites and limestones, with Mt. 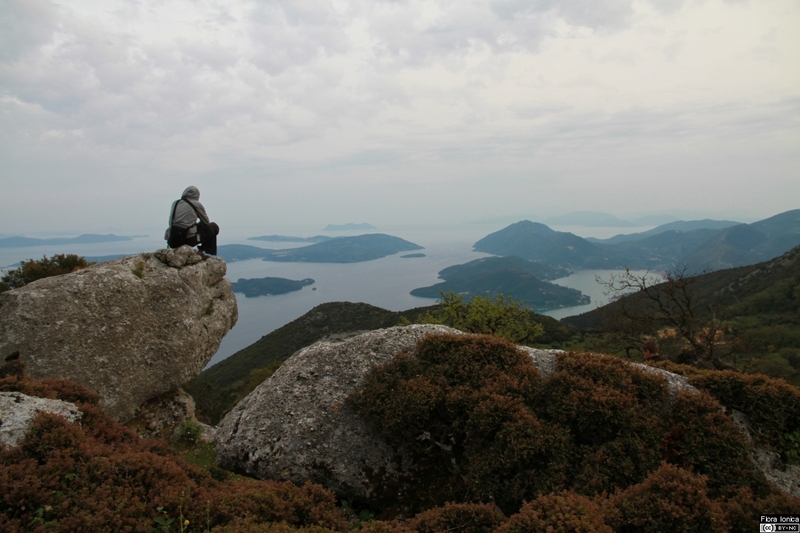 Aenos (1628m) as the highest point of the Ionian Islands (Bergmann & al. 1985a, Bergmann & al. 1985b, Higgins & Higgins 1996). 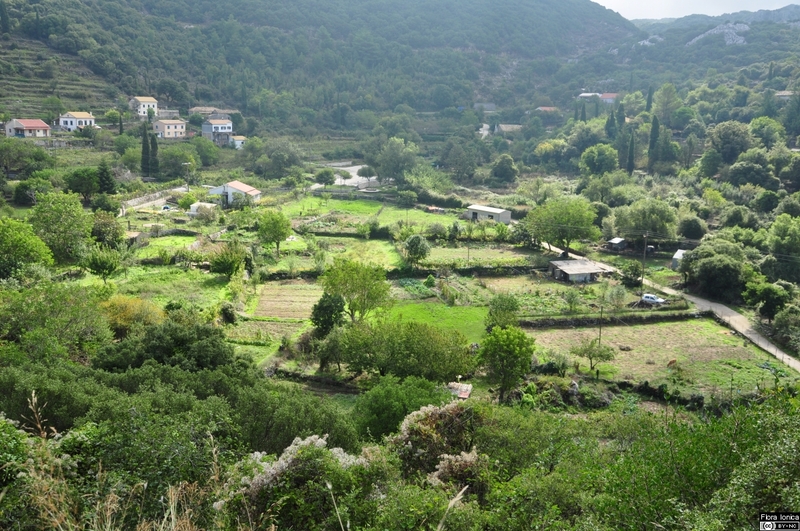 Ithaca lies almost exclusively within the Ionian Zone. Except for small areas covered with flysch and marls in the north-westernmost part, it is dominated by limestones. 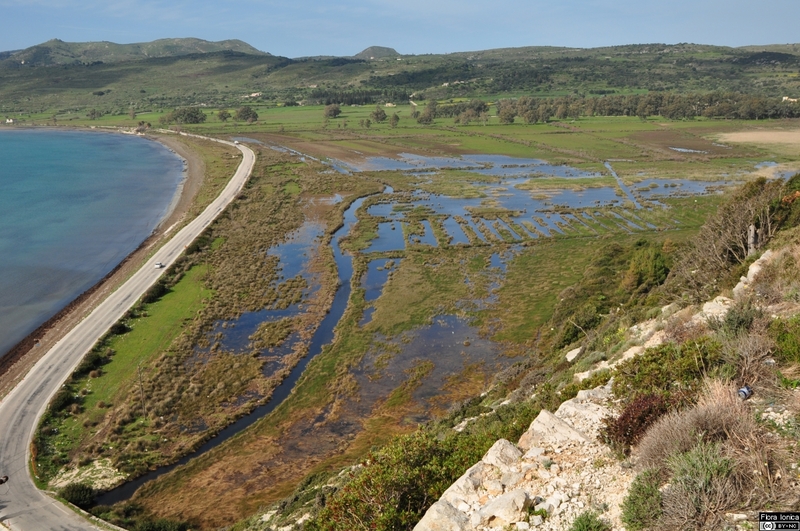 Due to limestone dominance both islands, Cephalonia and Ithaca, lack surface water (Higgins & Higgins 1996, Stavropoulos 1991). Zakynthos is mainly situated in the Pre-Apulian Zone. 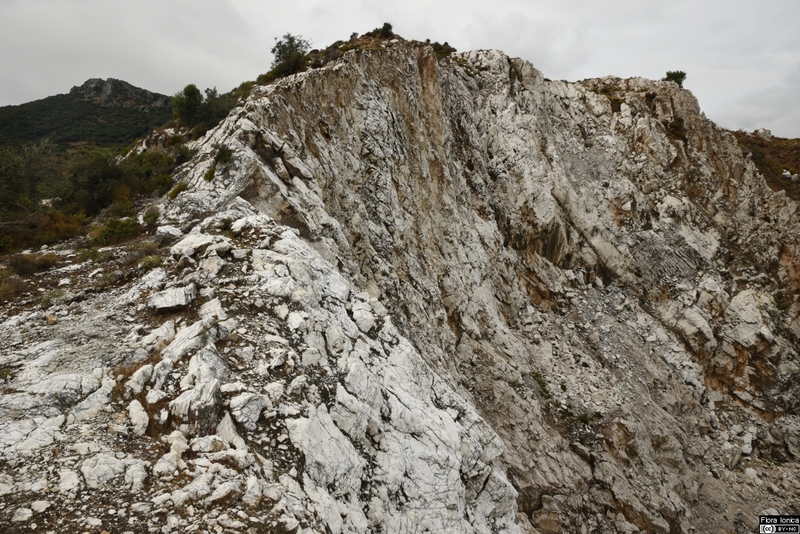 The larger western part is dominated by limestones, the central by sandstones with small scattered layers of gypsum. 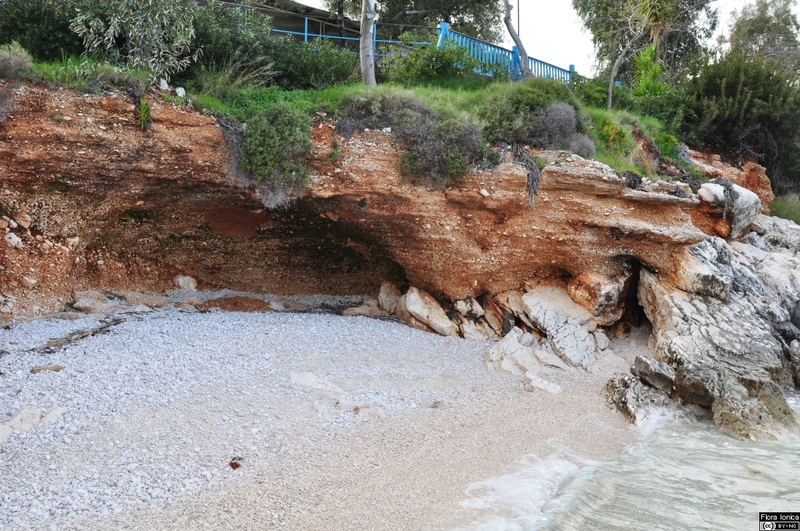 The small southeastern peninsula, belonging to the Ionian Zone, is mainly build of sandstone with small areas of limestone as well as gypsum and limestone breccia (Higgins & Higgins 1996, Perry & al. 1980). 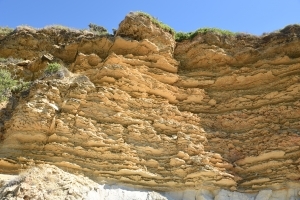 The above mentioned sediments are usually covered by terra rossa soils (Higgins & Higgins 1996). Multiple plate junction offshore the Ionian Islands result in frequent earthquakes, especially on the central and southern islands (Sachpazi & al. 2000, Vött 2007). The Ionian Islands are located in the mediterranean climatic belt, which is characterized by hot, dry summers and mild, humid winters. However, climatic conditions on the islands are generally more balanced. 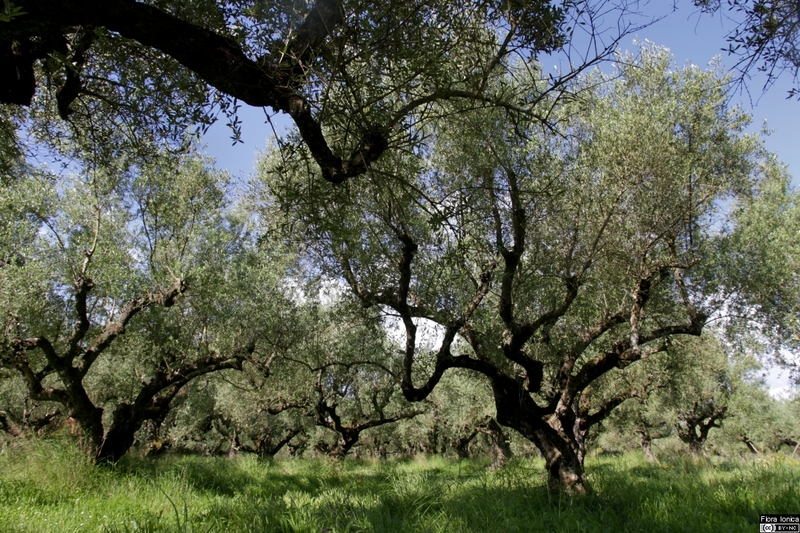 In winter, cold north winds are shielded off by the massifs of the Greek mainland and summer temperatures are moderate due to the island situation. From N to S a gradual reduction in the number of days with temperatures below zero and extended drought periods in summer can be observed (http://www.hnms.gr/hnms/english/climatology/climatology_html). 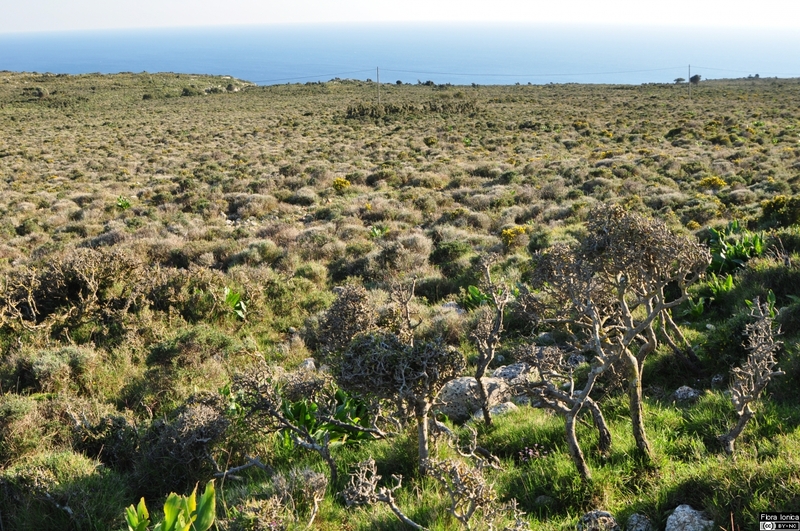 The thermomediterranean belt is restricted to the coastal areas and is characterized by the occurrence of wild olive (Olea europaea) and carob trees (Ceratonia siliqua). 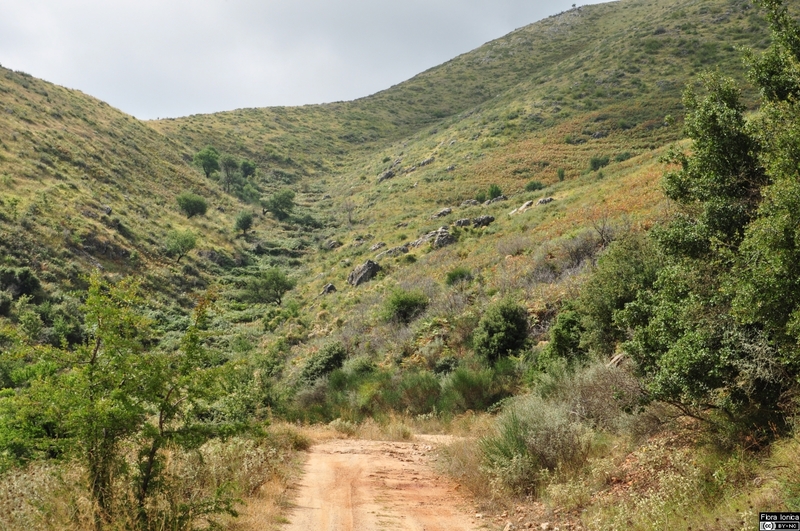 The adjacent mesomediterranean belt continues at higher elevations and is likewise defined by evergreen trees and shrubs such as kermes oak (Quercus coccifera) but lacks vegetation characterized by the above mentioned two species. 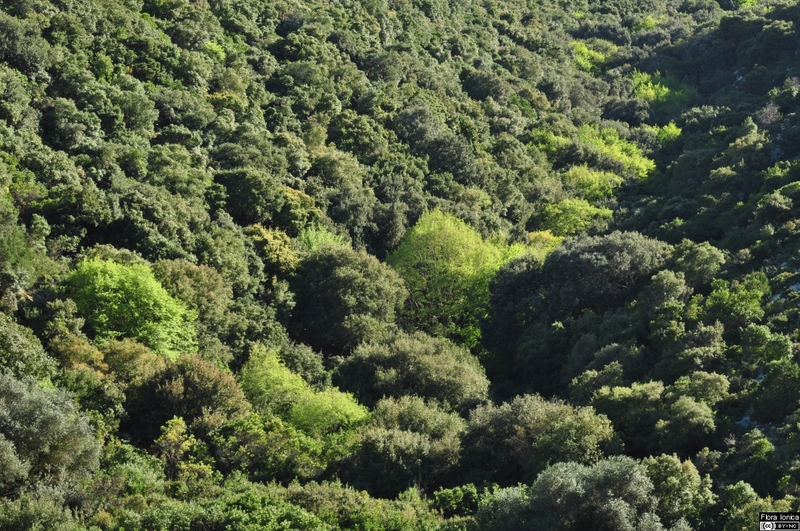 Via the supramediterranean belt with deciduous forests, and species like the turkey oak (Quercus cerris) or the hop hornbeam (Ostrya carpinifolia), the altitudinal zonation is completed with the oromediterranean belt dominated by fir trees (e.g. Abies cephalonica; Blondel & Aronson 1999). 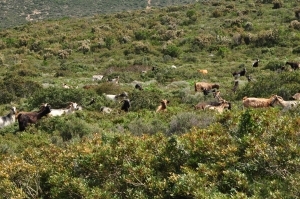 Embedded in each altitudinal zone, a variety of azonal habitat types may be found. 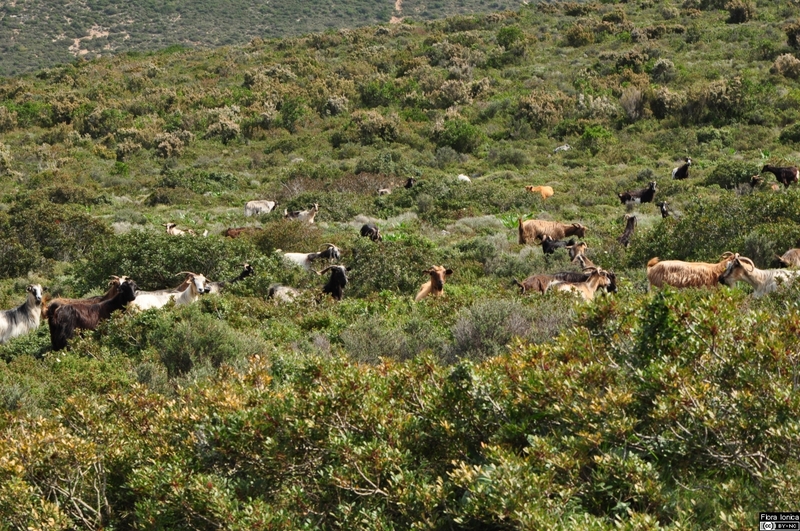 Together, the resulting diversity of ecological niches allow for a high number of habitats and species. 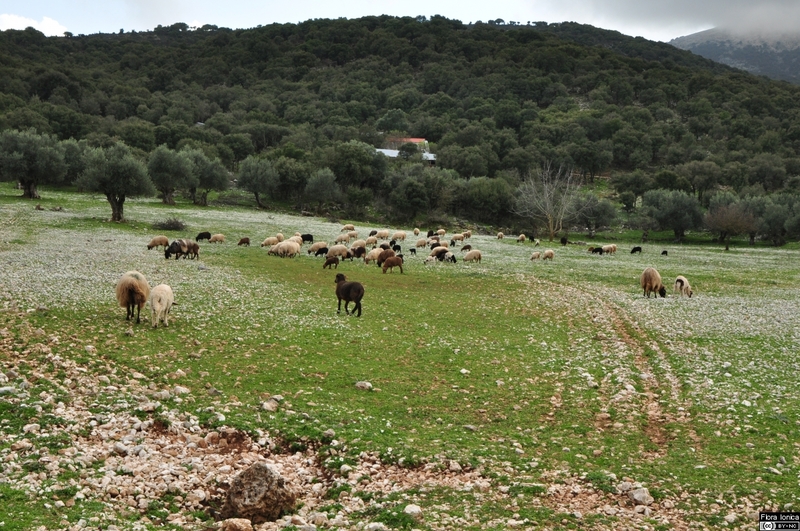 The actual vegetation of most islands is largely moulded by agriculture dating back to ancient times. 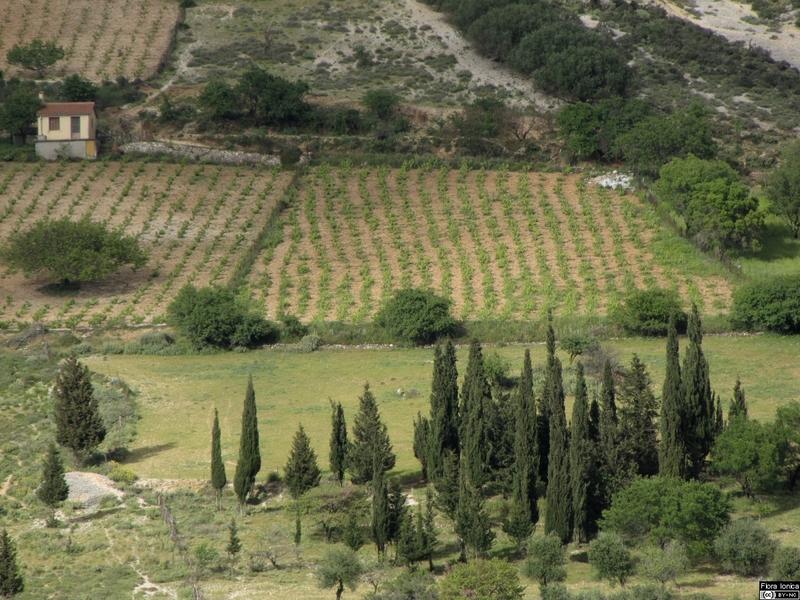 Terraced fields, nowadays partly abandoned, are extending to high altitudes. 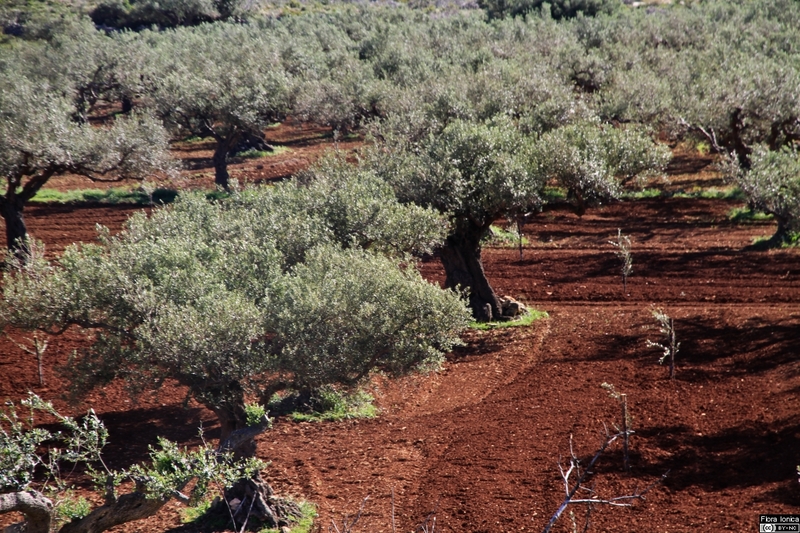 In particular, wide-stretching olive groves dominate the landscape. 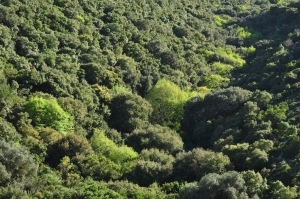 Intermixed are various degradation stages of mediterranean evergreen woodland, such as macchia and more intensely grazed garrigues, both dominated by sclerophyllous and spinous shrubs and lianas. However, floristic diversity is extraordinarily high, and anthropogenic influences have partly led to an enrichment of the local flora. So far, on a total area of appr. 2,300 km², more than 1,900 species of indigenous and naturalized vascular plants have been documented. 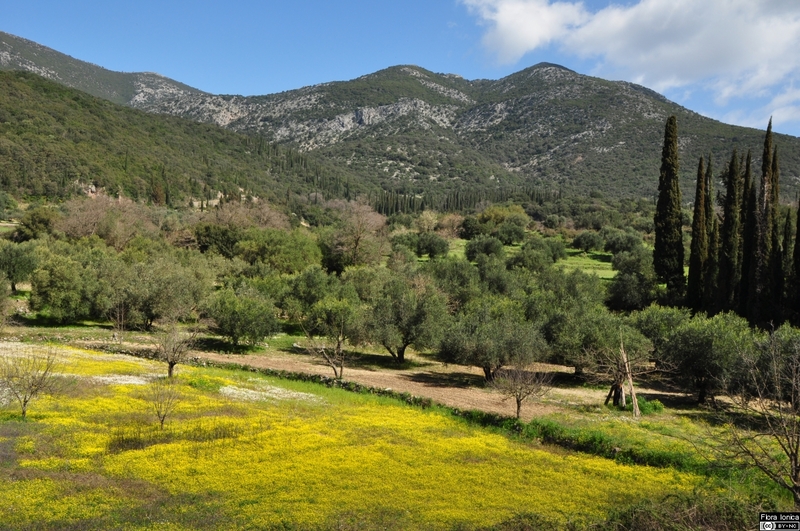 Thus, the Ionian Islands host appr. 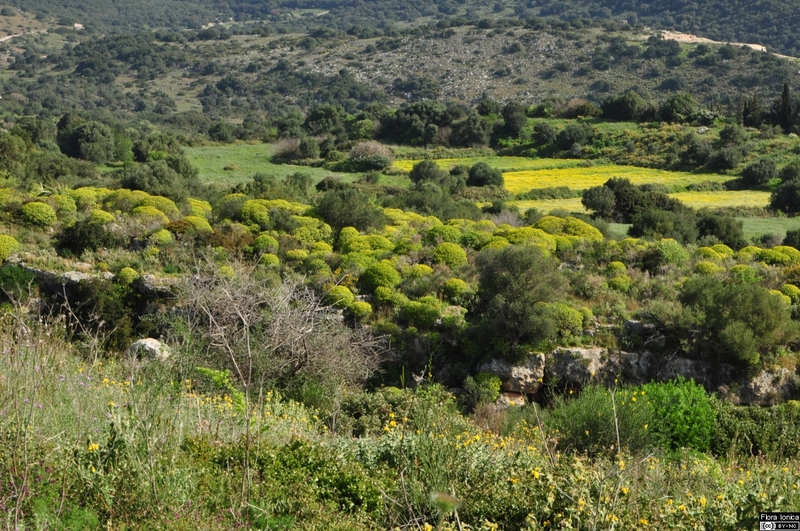 the same diversity in plant species as the considerably larger island of Crete (Jahn & Schönfelder 1995), which is well known for its high plant biodiversity and a notable number of endemics (172 taxa) due to its long isolation. 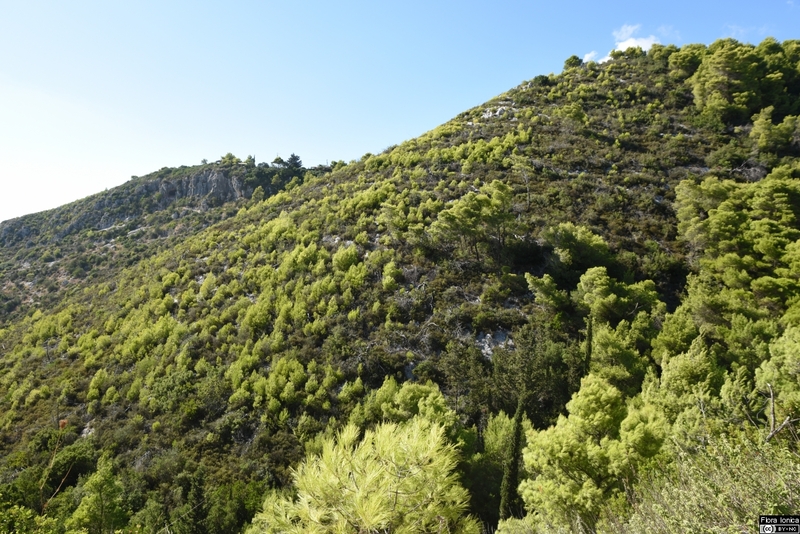 By contrast, only a little more than a dozen plant species are (sub)endemic to the Ionian Islands, many restricted to coastal cliff habitats. Several endemics have been discovered in recent years, some already published, for others the description is in progress. According to the Habitats Directive (Annex 1, Dir. 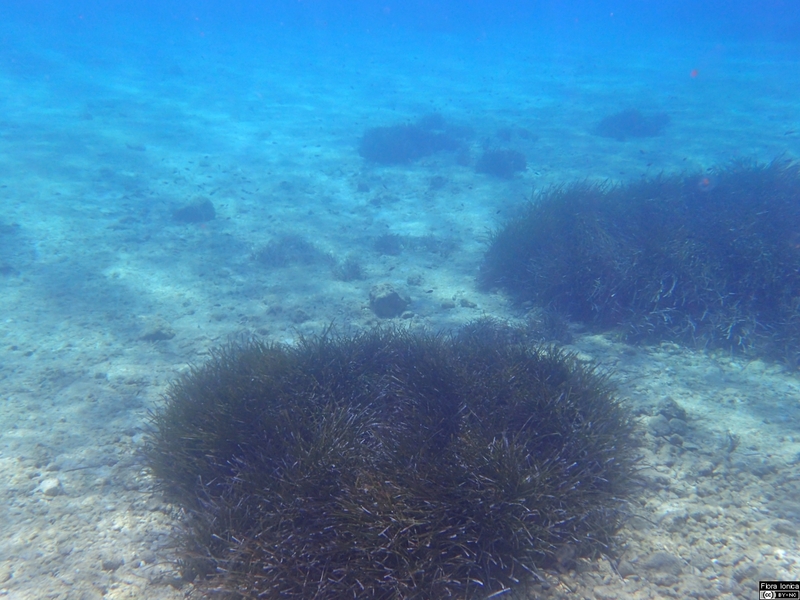 92/43) of the European Union, parts of the islands and the surrounding Ionian Sea were designated/declared Natura 2000 sites. 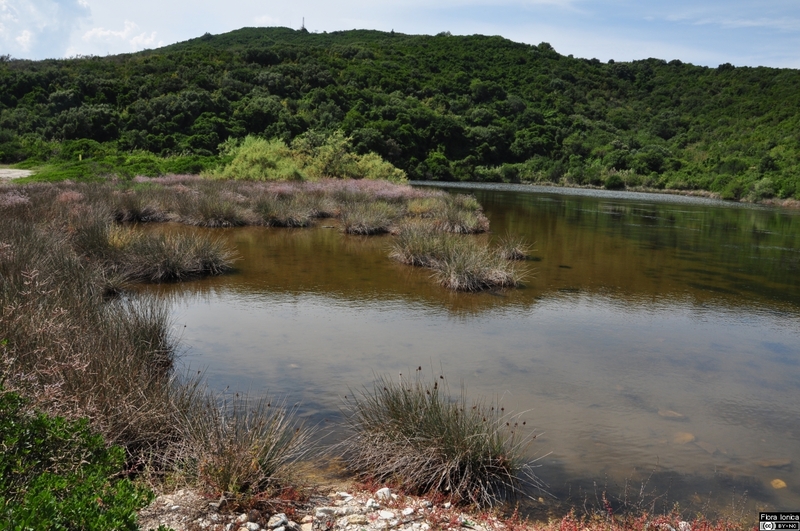 Protected sites, including large areas of marine habitats, cover almost 2,700 km² and comprise more than 30 endangered habitat types such as Coastal lagoons (No. 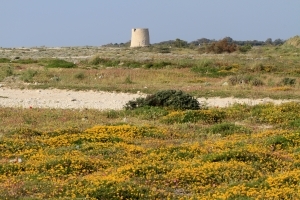 1150), Mediterranean salt meadows (No. 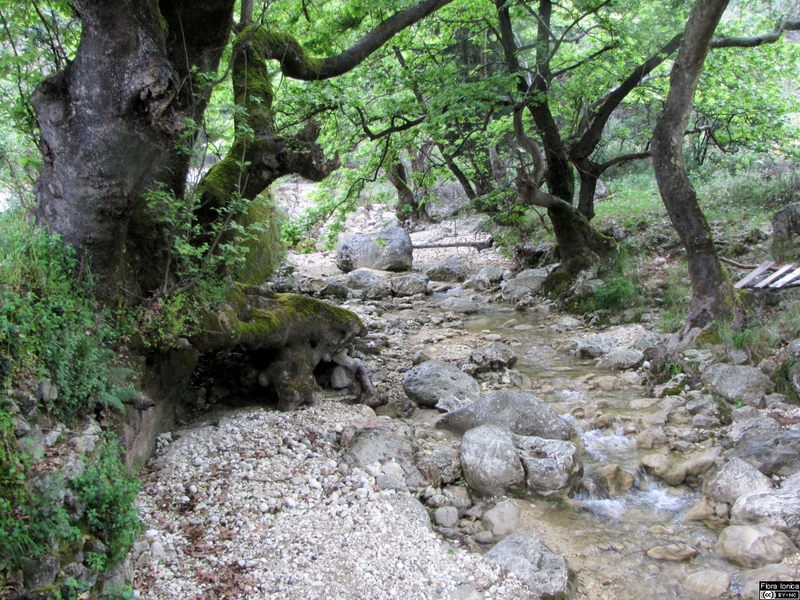 1410) or Olea and Ceratonia forests (No. 9320). 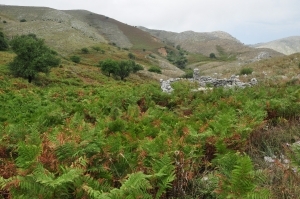 Among the 21 Natura 2000 sites are the Mt. 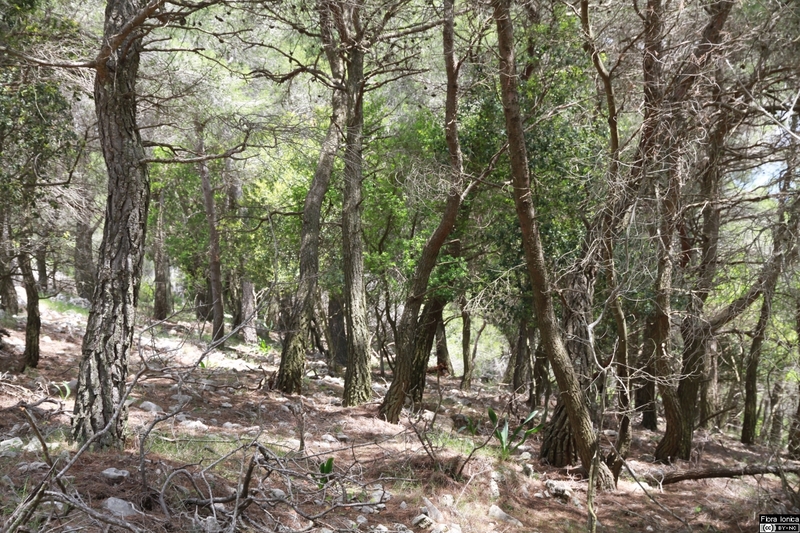 Aenos National Park on Cephalonia with a large population of Greek fir (Abies cephalonica), the National Marine Park in the Laganas bay area with sandy beaches offering oviposition sites for the loggerhead sea turtle (Caretta caretta) or the Strofades, which are part of a larger National Park mainly covering the Missolonghi-Aitoliko lagoons complex on the adjacent mainland (Panitsa & Iliadou 2013).